Order your Aurora Limited Edition 100th Anniversary Edo Fountain Pen today from FahrneysPens.com. Fine Pens, Refills & Luxurious Gifts – great prices & fast shipping. Aurora introduces the line “Cento Italia”: 10 “Iconic pens” from the history of Aurora, symbolizing the 10 decades. 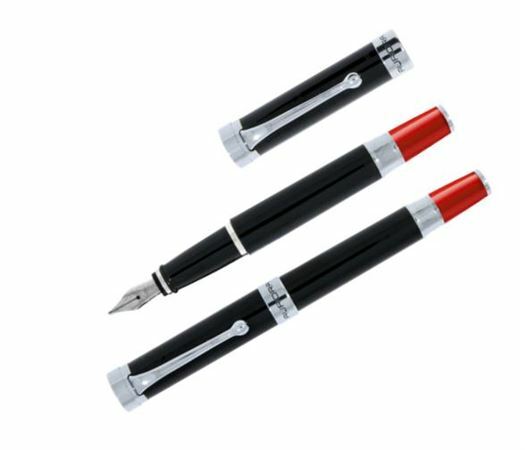 The first of these very limited anniversary pens is the Aurora Edo in black resin, chrome plated trims and 14 kt solid gold nib, rhodium-treated, embellished by an exclusive shiny red bottom. Every pen will be packed in an elegant box in black leatherette with black interior dressed by a special commemorative red sleeve with the new logo Aurora Cento!